Above first row left, we see the altar of St. Peter Church in Assisi on October 27, 1986. On the altar, at left, is a parchment/banner with religious inscriptions; above the Tabernacle, in the center, is a glass cylinder encasing a gold statue of Buddha; in front of it is a gold censer shaped as a lotus flower. The other objects to its right - candles and a religious book - are hidden from sight by the purple banner that stands several feet from the altar between it and the central aisle of the church. 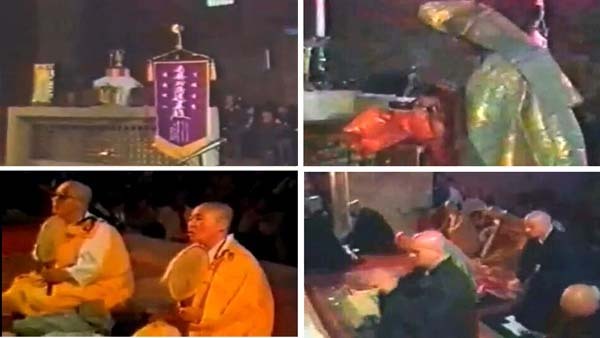 The second photo, first row right, shows a Buddhist Tibetan dignitary solemnly burning incense to the idol. In the second row, we see two sets of pagan monks around the altar worshipping Buddha. Below first row is the statue of Buddha on top of the Tabernacle, which can be seen more clearly here. 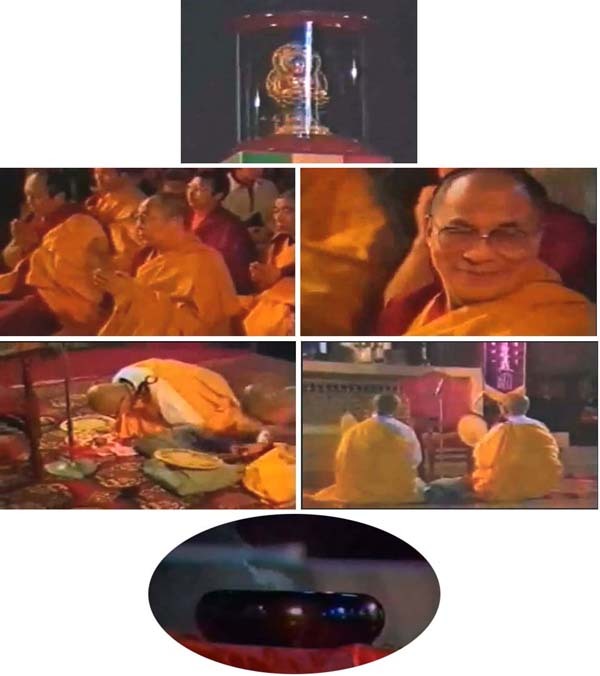 In the second row, the Dali Lama, supreme authority of that branch of Buddhism, is present at the act of profanation; third row, Tibetan monks adoring their idol at the foot of the altar; fourth row, the pot with incense still smoking. In the fifth row, we see the Basilica of Assisi as it was when it was chosen by John Paul II to be the center of the Pan-Religious meeting of Assisi in 1986. The sixth row shows us the same angle of Basilica as it was hit by an earthquake on September 26, 1997. In the eighth row are photos from another angle, showing the rubble and other damage to the ceiling of the church.